Senior Airman Tanner Apple, 309th Aircraft Maintenance Unit dedicated crew chief, inspects the flight control accumulator , March 22, 2018 at Luke Air Force Base, Ariz. Apple was named the Air Education and Training Command crew chief of the year for 2017 and now competing at the Air Force-level. 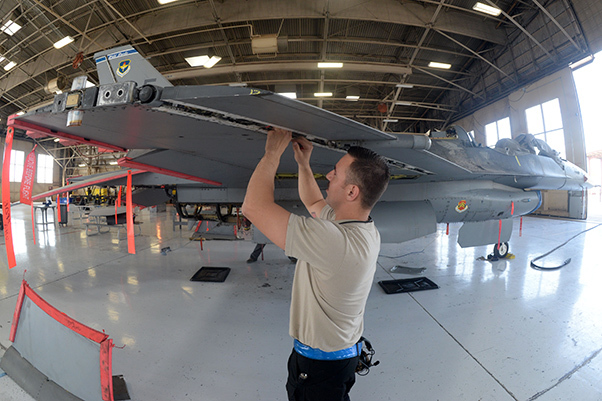 An F-16 Fighting Falcon dedicated crew chief assigned to the 309th Aircraft Maintenance Unit at Luke Air Force Base, Ariz., was named the 2017 Air Education and Training Command Crew Chief of the Year. Senior Airman Tanner Apple, a native of Bozeman, Mont., earned Major Command recognition by displaying a level of skill that far exceeds his peers, according to Master Sgt. Chis Eades, 309th AMU section chief. The Red X form is used to identify aircraft that are not mission ready and must undergo maintenance in order to be returned to service. Not only is Apple’s advanced skill for his rank impressive, but the mere fact he was even nominated for the award speaks volumes about his ability as a crew chief, said Eades. 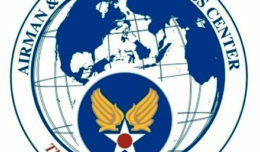 “It’s very rare for a senior airman to be even nominated for Crew Chief of the Year,” he said. 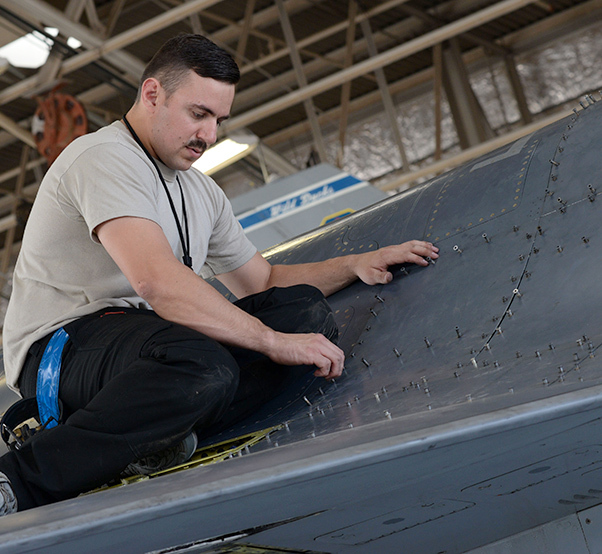 Senior Airman Tanner Apple, 309th Aircraft Maintenance Unit dedicated crew chief, pulls off an F-16 Fighting Falcon panel, March 22, 2018 at Luke Air Force Base, Ariz. Tanner, a native of Bozeman, Mont, is the only senior airman qualified to sign off on the Red X form used to identify aircraft that are not mission ready and must undergo maintenance in order to be returned to service. Apple, a first-time MAJCOM award winner, said being named AETC Crew Chief of the Year would not have been possible if it wasn’t for his leadership pushing him forward and recognizing his hard work. “My supervisor has absolutely been the best I’ve ever had,” said Apple. “Without even asking, he’s put me in for awards. “I wasn’t aware (my leadership) put me up for Crew Chief of Year at the wing level, and then I was in the commander’s office when they brought it up (winning at the AETC level) … my heart kind of sank,” said Apple. According to Eades, this award is just one of many great things Apple will achieve in his career. 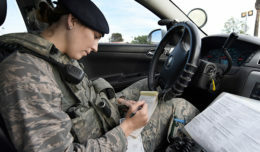 The senior airman plans to pursue a bachelor’s degree in hopes of commissioning as an officer. Before Apple’s promising future unfolds, the leadership at the 309th AMU waits to hear about their star crew chief’s hopeful selection for the Air Force-level Chief Master Sergeant of the Air Force Thomas N. Barnes Crew Chief of the Year award. According to Eades, they should know by mid-May. 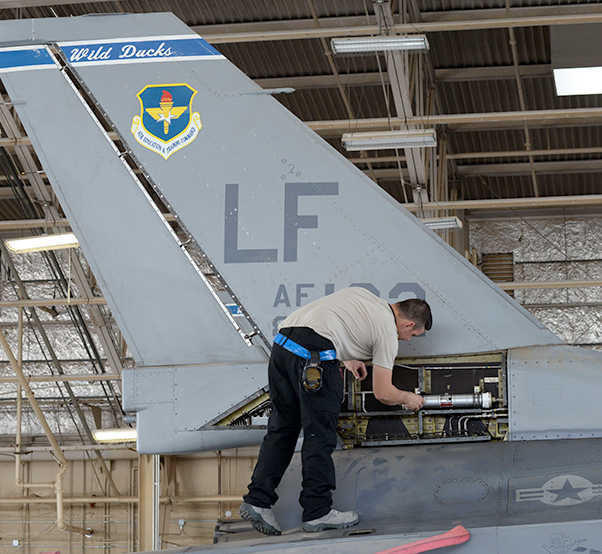 Senior Airman Tanner Apple, 309th Aircraft Maintenance Unit dedicated crew chief, inspects the leading edge flap of an F-16 Fighting Falcon March 22, 2018, at Luke Air Force Base, Ariz. Apple is responsible for maintaining safe and reliable F-16s which are essential for continuing to build the future of airpower.